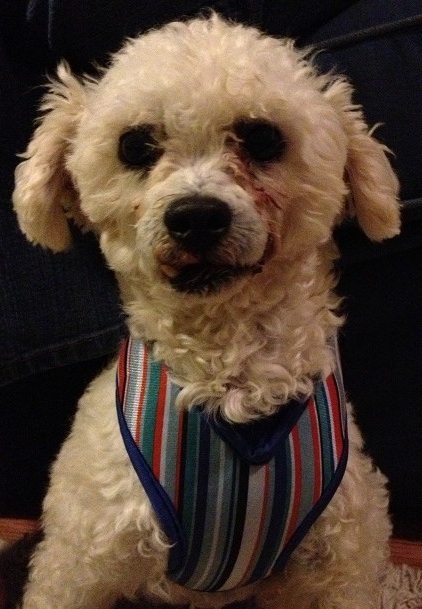 Tobey is a poodle-Bichon Frise mix and the perfect dog for us. This is only partially true. There is a dog named Pasha that lives next door to us. She is friendly and comes to the fence to watch us play and bark her greetings, but she is not our dog. We do not have to feed her, clean up after her or take her to the veterinarian. In my way of thinking, Pasha is the perfect dog. When the boys decided having their own dog was preferred to watching and petting the neighbor’s dog, I resorted to a more practical defense. To this the boys simply indicated they didn’t really want a big yard dog anyway. They wanted a little indoor dog like Jack, who belongs to my in-laws, or Leo, who belongs to my parents. I thwarted this argument on a medical basis. Barron, our oldest, now 11, has been particularly relentless. His research online has produced a list of breeds that do not shed. This week, I lost the battle. 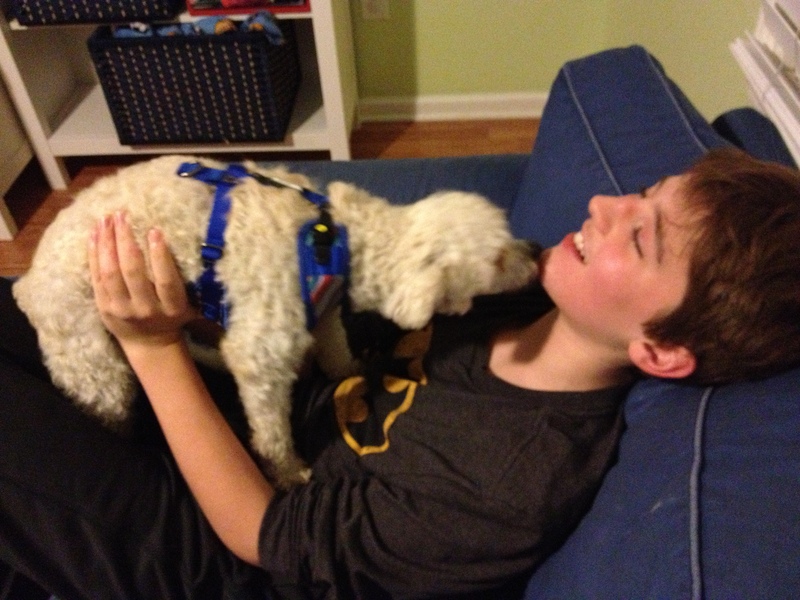 Two weeks after Barron and Carla met a poddle-Bichon Frise mix (or “poochon” if you prefer) named “Tobey,” at a pet store adoption day, we brought home another bundle of joy. Tobey, who is somewhere between 5 and 7 years-old, doesn’t shed. He doesn’t bark. He is house broken. He is playful without being rambunctious. He’s little. He’s been fixed. He can ride with us in the car when we go out of town. Barron was the biggest advocate for adding a pooch to our family. He’s reaping the rewards. Tobey has an answer to my every objection. Well, every objection except one, which may have been my real, deep-seated reason all along. Tobey will die one day after I’ve grown attached to him. How do I know this? Besides the obvious and unavoidable truth that all living things must die, I have experienced the loss of a pet. Perhaps I’ve never gotten over it. When I was a toddler, my father worked the night shift for American Airlines at the Dallas-Fort Worth Airport. Not wanting to leave my mother alone at night, he bought her a German Shepherd. Her name was “Tippi” for the tuft of black fur on the end of her tail. Tippi developed tumors, and eventually the canine cancer progressed to the point that my parents had to have her euthanized. By that point I was old enough to have read “Where the Red Fern Grows” and watched “Old Yeller.” Losing Tippi was every bit as painful as vicariously grieving the loss of those fictional pets. My defense was to shut down my capacity for connecting with animals. I avoided other people’s pets and even shunned my parents’ dogs when we moved into a house my sophomore year of high school that had a large, fenced-in yard. Their two lab mixes were as friendly and loyal as ever two dogs could be, but I resolutely kept myself from getting attached. No dog could replace Tippi, and I knew that if I let another dog into my life, it would end in heartache. But here I go again. Maybe Tobey can help me access a side I have shut off for 30 years. Maybe the joy of seeing my boys laugh and play with their dog will soften the pain I have suppressed for decades. Maybe I will be old enough now to understand that the companionship of a dog is so sweet that even the pain of its passing can’t outweigh the time spent building that special bond. I will also take this opportunity to teach the boys responsibility. They will bathe him, feed him, give him water, walk him and clean up his poop. Aw, who am I kidding. It’ll be me standing out in the backyard in freezing temperatures with a plastic bag on my hand waiting for him to do his business. And as I stand there shivering and contemplating my sanity, I will bond with Tobey. He’ll be my little friend, too. And maybe, just maybe, I will heal from a little boy’s loss and learn to love again. Do you remember your first pet? Have you had to recover from the traumatic loss of an animal companion? Share your story by leaving a comment below. You’ll feel better, I promise! This entry was posted in Uncategorized and tagged Bichon, Bichon frise, breeds, brothers, children, contemporary South, dog, family, German Shepherd, getting a dog, Kate Campbell, Lance Elliott Wallace, Lance Wallace, New South, New South Essays, NewSouth, Old Yeller, parenting, pet, poochon, poodle, relationships, South, Southern, Southern Culture, Southern Living, Southerners, the South, Where the Red Fern Grows. Bookmark the permalink. Shivering, or in my case, during a tropical storm with the dog looking up at you with the, “what?” expression. Good luck. We have lost quite a few dogs through the years. Tippi was our first. It is never easy. They become part of the family. Oh, the dogs I have loved and lost–tiny pomeranian Timmy, elegant Lassie, the scoundrel wire-haired fox terrier Scruffy, patient Starr (our first Basenji), loyal black lab Fanny, sweet Starr and sometimes grumpy Rusty (our 2nd and 3rd Basenjis). I was heartbroken at each loss but found new joy in each new loving companion. Currently we live with (and are servants to) two more Basenjis and one Australian cattle dog mix. We have lost two of our five beloved Jack Russell Terriers. Both within two weeks of each other. The remaining three Jacks continue to bring us joy and companionship. I am happy that Tobey has become a part of your family. Even when they die, their memories live on close to our hearts. Timely read for me Lance. I’m within weeks of inviting a dog or two to come live with me on the farm. I haven’t had a dog since leaving home for college and have wanted one ever since. My life has been too transient to be a humane pet owner. One of the first questions my girls asked when they found out I was moving was, “Can we get a dog!?!?! ?” Despite knowing the pain of having buried every dog that’s ever been “mine,” it’s finally time to get another one. I hope y’all enjoy having Tobey as a part of your family! We own a Bichon Frise (10 years old) whom we love as much as the grandchildren. True, she is not a protector. If you’re thinking a dog is protection, don’t get a Bichon. However, if you want a lap dog, companion that sticks like glue, loves you more than her next breath and sits on the bath mat and cries while you shower because she misses you, then a Bichon Frise is the dog for you. Never had a better dog than Miss Cuddles!!! We take her every where we possibly can. She has been to church with us on occasion. NEVER, NEVER do we go on vaction without her.